I woke up early and packed my bags. My flight was at 14:35 and my destination was Budapest, Hungary. I navigated to my terminal and fell asleep there. I boarded my plane via a metal staircase and enjoyed reading my book, A Heartbreaking Work of Staggering Genius by Dave Eggars, for the duration of the 1 hour 20 minute flight. Eggars wrote about his family mostly, and how his parents tragically died of cancer four months from one another. He wrote about what it was like to raise his younger brother. The more I read about his relationships with his family members, the more excited I was to see my older sister, Theadora, who has been studying in Budapest for the past months. I walked off the plane and there she was. Sitting in my terminal, short blonde hair and big blue eyes. We hugged and I bought myself a monthly student bus pass, something I would recommend to any student staying in Budapest, as it is cheaper than the five day pass purchased by most tourists. The ride into the city was long, and my sister and I talked quickly with the kind of secret language that only exists between siblings. Finally we arrived at her stop. I rode the long (I mean really long) escalator from the underground up to the daylight. As I stepped up to the sidewalk, I was awestruck by the beauty before me. The Budapest Opera House is something worth seeing, and the ornately carved outside of the giant structure was nothing compared to the beautifully painted ceilings within. Theadora’s apartment was right across the narrow paved road in a tall, stone building. Immediately I could tell that Berlin and Budapest were two very different cities. While Berlin is inspiring and gorgeous in its own way, Budapest has a much more obvious beauty; it is almost glamorous. The culture of the city is also unique. My sister, a government major, explained to me that the seemingly homogenous society was the result of the country’s nationalist tendencies. Hungarians, or at least their majority, are passionate about preserving a Hungarian identity and about keeping traditions and cultural norms from adapting or integrating people with different cultural backgrounds. In the morning we fried ourselves some eggs in Theadora’s quaint fourth floor apartment; opera could be heard through the window, traveling on the wind from across the street. My first day in the city was a stormy one, and Theadora decided to take me first to Margaret Island, which is between Buda and Pest (she lived on the Pest side), right in the middle of the Danube River. There were many blossoms which glowed in the bright damp light. We ate cotton candy in the park (raspberry flavor was chosen, after much deliberation) before hopping on a bus and exploring Buda. The rain started coming down harder than before. We wanted shelter but were not yet ready to give up exploring. Theadora suggested a brilliant compromise that ended up being the highlight of my trip. 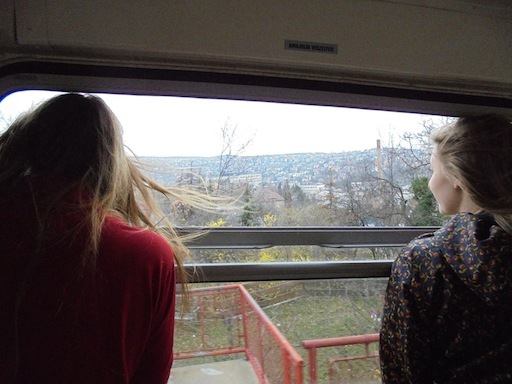 With our bus passes, we were able to ride on an old cog train, weaving up a mountain in the middle of a storm. Before boarding the train, we bought ourselves some cheap cappuccinos, which were made with whipped cream in place of milk froth. Though not the classiest beverage, they were delicious. Peering out the window we were able to see into people’s backyards on the steep mountain. When we reached the top, we stumbled upon a lonely café, where we enjoyed some beers and goulash, a spiced meat and noodle stew that happens to be one of Hungary’s signature dishes. It was the perfect comfort food on that rainy day. The next day was spent picnicking in the Hungarian country side. Without researching our destination, we hopped on a train and found ourselves by a beautiful lake. Our feast consisted of meats and cheeses bought at a farmer’s market, which took place in one of Budapest’s first ruin pubs, Szimpla Kert. The day after returning from the country side, we were lucky enough to encounter particularly sunny weather. The afternoon was spent water coloring in a massive graveyard, which was not as scary as it might sound. The graves – like many things in Budapest – were very old, beautiful, and ornate. There was perfect grass expanding in every direction. We left at sundown for one of Theadora’s friends’ house. There was a horse stable along our path to the bus, so we stopped to pet the splendid animals for a minute; it was enchanting. At Theadora’s friend we handmade pork and chive dumplings with other ingredients bought at the market. There’s nothing like a tasty meal with good people. On my last day in the glorious city of Budapest, Theadora and I discovered yet another great use of our bus passes. The ferries in Budapest are a part of the city’s public transportation and are therefore free to ride with a pass. We took a joy ride. The boat was a great way to see the varying architecture of the city from an exciting perspective. I would recommend this mode of transportation to anyone planning to visit. Finally, at the last stop, we got off the ferry and took a bus that led us to the castle district in Buda. The view was amazing, as were the buildings themselves. I was later informed that Walt Disney actually found his inspiration for Disney Land in that castle. We picked up some ice cream from a nearby shop and walked over to the old parliament, which is impressively large. From there, we looked across the river to the ornate and equally impressive new parliament building. In that moment, watching the sunset, I knew I was going to miss Budapest.